The main purpose of the site is to have a place to share photo's with family and friends. With Sue and I living in England and the kids and grandkids still in Maryland and Virginia, this site has become the easiest way for us to keep up with each other. We also share photo's of our Mangum family reunions, Billy's travels, and my visits to English pubs. Please remember when looking at the photo's on all the linked pages, that you need to Click on the thumbnail pics to see the full-sized pictures! And PLEASE don't forget to sign my guestbook!! Sue and I visited Billy, May and Marissa in Port Orchard for two weeks in September. We had a ball. They spent lots of their time showing us the sights. Had some good weather (and had some rain). Two weeks just flew by - wish we could've stayed longer - a year or so!! Sue and I visited Susie and her family to see Sierra graduate from High School. Also spent time with my friend Evan and his family. Sierra, Best wishes as you leave home for university. Thank you Susie for a great time!! Wanda made a remark on Facebook about me and my pigs, so I decided to put up some photos of some of the ones found in my house. It's a local tradition to gather at the Golden Ball Inn to wish everyone good cheer and a Happy Christmas before going home for a huge lunch. Sue's doing a standing rib roast this year, I can't wait. Billy, May and Marissa spent Thanksgiving Week with us here is Shropshire. We really enjoyed their visit, but it passed so quickly. Looking forward to next spring in hopes that we can go see them in Seattle. Sue and I spent a couple of days over in LLangollen, Wales. It's only an hour (and a whole world) away from home. We stayed in a wonderful old B&B. Could not get the suite I wanted on our first night, but we moved over to it the next day. Excellent place to spend a quiet weekend! Rode the steam train alongside the river through the valley on Sunday. Susie, Ben Sierra, and Edward spent two weeks with us in early July and then Sierra stayed three more weeks. We stayed pretty much close to home, with day trips to Wales. They took the train down to London for a quick tourist visit. Then Sierra, Sue and I went up to the Lake District for a week. It rained every day, but we still enjoyed ourselves. We really miss her now that she's gone home to start her last year of high school. Sue and I spent the long May Day Weekend in Suffolk. We stayed at the 450 year old Bull Hotel in Long Melford. Spent Saturday shopping in Ipswich and Sunday at Kentwell Hall where they were having a Tudor May Day festival. And of course it was wet and cold, but we still had a great time. (Note that Sue is wearing gloves in a couple of pics). This morning after breakfast (I had smoked kippers) we stopped by Long Melford church for a couple of photos before setting out for home. Here are a few photos taken over the Easter Weekend. 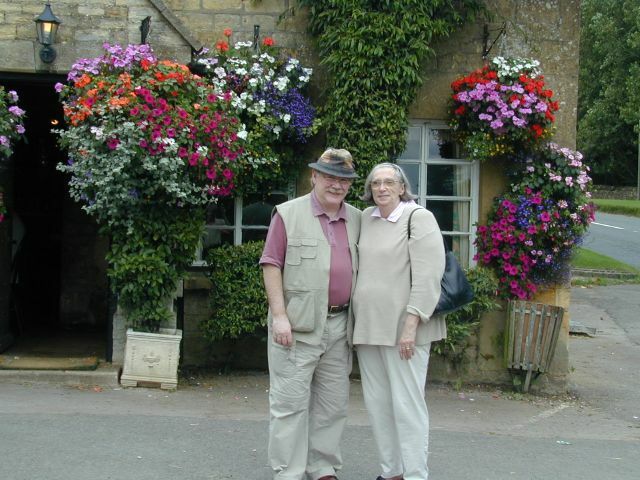 Sue and I went to Bakewell in the Peak District and stayed in a lovely Guest House Hotel. Spent a day visiting the beautiful old Haddon Hall. Here are a few photos taken when Sue and me went to Wales for lunch. We left Telford in rain, sleet, and snow on the promise from the Met Service that there would be blue skies and sunshine by the time we got there. And for once they were right. The sun was out and the views were fantastic! Here are a few photos taken during the Holiday Season.Wishing everyone a wonderful 2012!! Here are a few photos taken during a five day trip up to the Peak District. Again we stayed in an old stone barn that was delightful and cosy. The highlight of our trip was a visit to Chatsworth House which was decorated for Christmas. Beautiful!! Here are the photos we took during our recent visit to Aldeburgh, Suffolk. We stayed in a lovely cottage right on the seafront, just behind the fisherman's shacks where they sell their catch. We were supprised to learn when we got there, that the cottage is featured in a daily kids show called "Grandpa in my Pocket" It seems every kid under six years old thinks Grandpa lives there and lots of them kept knocking on the door to see Grandpa. Our visit to the Lake District. Sue and I spent a week in Cumbria - without a doubt, one of the most beautiful places in England. The mountains, lakes and forests are stunning. We visited several of the local villages and pubs, and also four or five of the lakes and more pubs. Brian came and spent a couple of days with us and we visited even more pubs. Very enjoyable time had by all. Blaine and I were stationed together at Martlesham Heath Communications Facility in Suffolk in 1967-1969. We spent a week reliving old memories in Suffolk and then came over to Shropshire for a week. Had a blast, but ran out of time - too few hours, too many places to go and see. We are already planning for next time. Billy and Marianne were married on 7 April 2011 at St. Columba Church in Oxon Hill, Maryland. Here are a few of the photos taken on the day. I will be posting photos of the rehearsal dinner and the wedding reception real soon. Several folks have asked for pictures of Billy and May, so here's a few including some taken at Fort Washington National Park where they got engaged to marry. Yes, we will have a White Christmas this year, the snow is here and isn't going anywhere before middle of next week, by which time we will all have had enough. Once again Mangums have been seen in Sevierville, Tennessee. Do not be afraid - we are only dangerous when not fed, and that's not likely to happen. Here are a few of us captured on film. Don't we look downright handsome?? Here are the photos we took during our recent visit to the USA. We spent a couple of weeks with Susie and her family in Virginia and then went south visiting Mangums in Tennessee, Georgia, and North Carolina. The time went by so quickly that it seemed like we were returning home before we even got there. Looking forward to going back in April. Here are the photos we took in Suffolk while celebrating our 40th wedding anniversary. We chose to go back to Suffolk where we first met 42 years ago. Stayed in a beautiful old barn cottage - four hundred years old, but with all the modern conveniences. Had a wonderful time. Here are the photos we all took while visiting family and friends in Virgina, USA. this year. 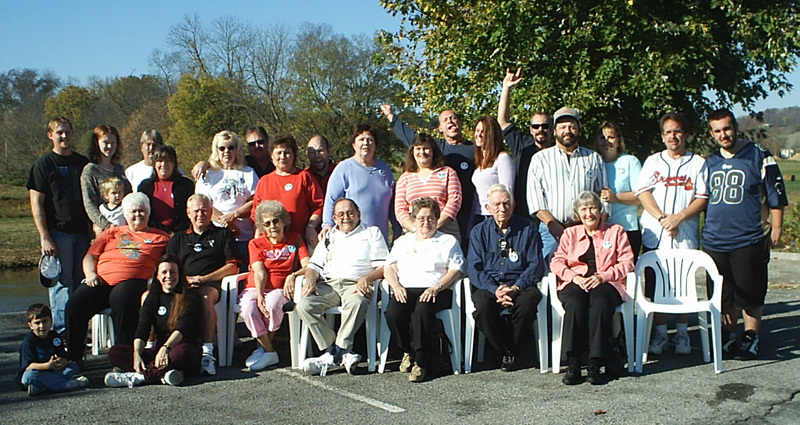 Here are the photos we all took at the annual reunion in Tennessee. Here are the photos we took during Rodney and Betty's visit to Shropshire. Billy, this link is for you.. Happy Birthday!! Sue and I spent this past week at Lake Vyrnwy Hotel in Wales. The lake is surrounded by hills and is only accessible by a couple of small roads. There was no signal available on my mobile phone so I had no access to the internet. We had to take day trips so that I could check my e-mail. We just sort of chilled out, enjoyed the peace and quiet, and I enjoyed the local ales. Here a few photos of our trip to the see the kids and to VOTE!! Sue and I are enjoying the warm weather out in the garden. The hanging baskets are at their best, the garden itself is in need of a good trimming but I'm having a lazy day. Sue and I have really enjoyed having Susie and the grandchildren visit us. Going to miss them when they go home. Sue and I took a few pictures at the Golden Ball Inn's New Year's Eve Party. Hope you enjoy them. Once again, a group of friends at the Golden Ball Inn have gone to the Abbey Club in Buildwas for an evening of Christmas celebrations. We wish you all a very Merry Christmas and a Happy New Year! Here are a few photos of family and friends taken from our trip to the USA earlier this month. Also a couple of earlier pics from Billy. Sue and me traveled to Tennessee for the eighth annual Mangum family reunion. Had a great time seeing family and friends again. More new faces this year, and a few absent ones as well - Buddy and Jonnie are both on the mend from recent illnesses and were sorely missed. See you all next year! Sue and I decided to take advantage of the warm weather, so we spent the three-day May Day week-end in Wales. Had a really nice week-end just enjoying the food, drink, and beautiful views. Not much beats sitting on river bank with a good beer, and nothing to do but sit and enjoy. Well, winter has finally arrived in Shropshire. Until now we've had a very mild winter - global warming, you know.. Wednesday the temperature dropped down to freezing, yesterday we got four inches of snow in Ironbridge/Madeley, and today we got another six inches. I've taken some photos here on Bridle Road. Am hoping to get down to the Ironbridge Gorge tomorrow for some pictures of the bridge and the town, providing I can get the car to the top of Bridle Road, snow will be cleared up there on the main road. Best wishes. I hope that all of your New Year wishes come true and that 2007 will be your best yet. Once again the Golden Ball hosted a New Year's Eve party, this year in fancy dress. Most of the usual suspects attended, although I've heard that one of Snow White's dwarfs was missing. Any truth to that rumour?? Let me know..
Billy, May, & Marissa visited New Mexico back in October during the annual Hot Air Balloon Festival. He sent me a disk of photos, but I had forgotten to put some on them on the web till now. Here they are. Members of the Golden Ball community celebrated our annual dinner at the Abbey Club last night. Wounderful time!! For those of you that may think that there may be some missing pictures, well... sorry, the film was all foggy.. and I'm sticking to that story. We spent three weeks in the states in October, most of it with the kids and grandkids. Can't get over how much Sierra and Ed have grown during the past year. Here's a few pictures. Once again the Mangum family gathered in Sevierville, Tennessee to pick banjos and discuss the big issues of the day (who's bought the biggest gun this year, who's going to win the NASCAR championship, how much younger has Mike got than his brothers). I've posted photos, so have a look. And would you believe eight folks missed the group photo this year because they got up before daybreak Sunday morning and drove five hours to Atlanta to watch a dangburn stock car race. Geraldine and Geoff got married today and the Golden Ball lost one of their regulars. Geraldine has been a familiar face in the Golden Ball community since moving to Ironbridge in 1998. She is a founding member of the NIPL club and Captain of the award winning rafts they have entered in the annual Ironbridge rafting regatta. She and husband Geoff have bought a lovely house in Church Stretton where they will reside after returning from their honeymoon in Jamaica. I've posted pictures that several of us took during construction of this years raft and of Race Day. Enjoy!! Well, we've finally decided on where we plan to settle and it's Here!! We've just about completed purchase of a house in Madeley, Shropshire and are due to complete the sale on 14 July. Billy is coming over for a week to help us get moved (and to top up his supply of real ale). I'll send everyone an e-mail with new addresses and phone numbers when we have it all sorted out. Here are a few photo's we took in May when we first looked at the house. Will post more after we get settled in. Howard, Marion, Sue and I have just spent a three day weekend in Barmouth, Wales. The weather was warm and dry for the first time this year. We pretty much had most of the beach all to ourselves. Had a wonderful time!!. Here's some photos that Billy took during his recent travels. Back in early March, which this year was the coldest month of the winter, several of us in the Golden Ball decided we needed sunshine instead of snow. So off we went for a weekend to Spain to celebrate Brian's birthday. Puerto Banus in on the Mediterranean coast down towards Gibralter and is where the folks with too much money park their yachts and play. So for a three day weekend, we mingled with the jet-set and forgot all about the snow. Photos of the festivities at the GB. Happy 2006!! Here's a few photos taken during our trip to the USA last month. Well folks, I finally got the pictures of this year's reunion posted. Once again we enjoyed seeing you all and now hope that you enjoy the photographs. Roddy & Robbie Mangum comes to visit us. My cousin Roddy and his wife Robbie came and stayed with us for two weeks. Sue and I enjoyed their visit and hope that they did as well. I force-marched them all over the country on one of my patented Sergeant Major's tour of the UK. All the exercise did me good (I lost five pounds). Roddy and Robbie have gone home to Georgia to rest, and I'm back to the wars (work, that is) tomorrow. I could sure get used to all this time off. Here is a small sample of all the pictures that we took. A small group of folks at the Golden Ball Inn are entering a raft in this years event. The raft is currently under construction and photos are located below. Sue and I just spent five days up on the Yorkshire Moors.. The weather was mostly cold, wet, and very foggy, but we stayed in a wonderful old Hotel in Whitby (in a bedroom that was nearly as big as our house). Rode the steam railway across the moors, and ate some really nice fish (fresh off the boat each morning). For those that don't know... Whitby is home to Capt Cook who discovered Hawaii for the English and Bram Stoker who wrote Dracula (who first came ashore from Europe at Whitby Harbour). Well the title says it all.. It's Easter week-end and the weather is getting warm enough to venture out. Sue and I went to Stokesay Castle and then drove down to Ludlow for a nice meal. There I was standing in my usual place of worship at the bar in the Golden Ball Inn with the after-work gathering of regulars when someone taps me on the shoulder. Looking around, there stands Billy. Seems he and May, in conspiracy with Sue, had come over to help me celebrate my big six-oh birthday. They had spent a couple of days in London and then came up to Much Wenlock. After spending several days with us, they took an overnight trip through northern Wales followed by a trip over to Ipswich with Sue before May flew back home. Billy plans to stay another week or so with us. Hey cousins (and brothers), I've started putting this years photos on line. Go take a look at the Mangum Family Reunion page (top left side of this page). I'll add more when I get back home to England. Sue's Mum suffered a heart attack and died on the 14th of October. She had been making an excellent recovery from the stroke she had in October last year. She had really enjoyed seeing her great grand children in July of this year and was looking forward to their next visit. She will be missed by all of us who knew and loved her. Well, we've had a typical English summer, a little bit of sunshine and a lot of rain. As a result, the flowers have been beautiful. Susie, Sierra, and Edward spent ten days with us. First time we've seen them in over 18 months, so needless to say, Sue & I spoiled the grandchildren rotten. Here are a few of the hundreds of photos I took while they were here. Spring started off pretty wet over here with lots of rain in April. As a result, the flower gardens are beautiful. The rain has finally stopped and this past weekend was absolutely gorgeous. Sue and I walked around town Sunday afternoon and I took pictures of interesting houses and buildings..
Betty, I've also included some pics of the flowers in the garden at home although I can take no credit at all for growing them. Bill, share the page with Bet! Richard, Wanda, Darrell and Laura spent a week here with us. We spent a couple of days in London and the rest up here in the West Midlands. Another of my patented whirlwind guided tours. I tired myself out this time, but we were able to see lots of places and even had time for a pint at my favorite pub. I hope they all had as much fun as me. Just received some more pictures from Chad. These are from a recent trip that he, Christian, and Melinda took to Disney World. Here's some photos taken while Billy was in England in January. Some were taken in Suffolk and the remainder in Shropshire. Next time you talk to Billy, ask him about "An American Werewolf in Jackfield"
Mike on a Bike. Chad sent me some pictures that were taken Christmas Day. A couple of great pictures of Chad, Christian, and the girls, and a couple of classics of Christian's Grand-dad. I've received the photos from the 2003 Reunion and now have them posted. You can see them by clicking on the "Mangum Family Reunions" sidebar. Hope you enjoy them as much as I have. Hey fans of the Billman!! I've just added a couple of pages of pictures taken during a trip Ken Dostie and Billy took to India in August of this year. I'll be posting more pages during the next couple of days, so check back again. Happy Thanksgiving Day to all you folks back home in the US of A.. Hope you're all well stuffed with turkey and feeling happy and content. Sue and I had a nice day in Ipswich with her Mum who has just returned home from hospital. Several folks at the Golden Ball Inn in Ironbridge have asked me to post the photo's taken during Brian's recent visit to Washington D.C. He stayed with my son Billy who gave him an entirely different tour of DC than the one I had planned prior to us canceling our trip back to see Susie, Billy, and the grandkids. As most of you are aware, Sue and I did not make it to the reunion this year. The day before we were due to fly to the States, Sue's mom had a stroke. She is still in hospital, but continues to improve. Sue is with her in Ipswich and I'm commuting back and forth between Ironbridge and Ipswich on the weekends. Looks as if we will move soon into a bigger place near Telford (where I work) that will fit us all. An absolutely gorgeous autumn day in the Ironbridge Gorge... And the Iron Bridge played host to a gathering of something uniquely English... Morris Dancers... There must have been at least 15-20 troops here today, 300 or more folks in all, with painted faces, bells, and clogs.. Hope you enjoy them as much as I did..
"Nice website, John! The only thing missing is a picture of MY mum. I see my dad in it!" Well, Tamsyn... Here's your mum (and other members of your family). Please note the the good-looking man standing second from the left in the first photo!! This has been the warmest summer in past five years.. Enjoying days outdoors and friends in the pubs..
Tracy passed away this morning.. He will be remembered and missed by us all. Paula sent me a picture taken during Reunion 2001 that includes Tracy. Sue and I have just returned from a short holiday in Cornwall. Here are a few of the pictures we took. Well, I've finally posted the pictures taken at the Mangum Family Reunion in November 2002.. Here's pictures of a couple of recent week-ends spent enjoying those rare days of English sunshine. Sally Belle passed away peacefully in the early hours of Sunday morning. The SAGA Louts have been on the road again. We took a coach trip to Bruges, Begium this past weekend. Had a fabulous time, and here's the proof!! What a year this one has been.. Shortly after my May update, my hard disk crashed. And took with it nearly five hundred photos that I had taken during early Summer, including a wonderful trip Sue and I took to York in Yorkshire. One would think that I make backups of my photos, but no, they are gone forever. We visited the States in early November and I've added a new page of the Kids & Grandkids. I'm trying to get the new Reunion pages ready, I'll post them soon. Well folks, Spring has arrived in England and Sue and I have been out and about, both here in Shropshire and over in Suffolk. You'll see from the photo's that I've spent more time visiting pubs (well, someone has to do it). The weather has been great for the past six weeks or so which is unusual for this time of year (or any other time of year for that matter). Also photos of the SAGA Louts. The following page contain snapshots that I've taken during the last couple of months, mostly winter scenes. Hope that you enjoy them. I've also added pictures of the Grand-children. This page was developed by John Mangum for your non-commercial use.